Q: I feel unprepared to make a proper suicide assessment with my clients. I’m nervous that I’ll neglect to ask, or the client won’t tell me, something vital to making the right clinical decision. Can you recommend an objective measure for reliably determining suicidality? A: Suicide assessment is a high-stakes process infused with uncertainty, so your desire to find an assessment instrument to help with your decision-making is understandable. However, even the best scales can be unreliable when they’re completed in the midst of an emotional crisis. Thus, rather than outsourcing your decision-making to an instrument, I recommend that you learn how to conduct a conversational evaluation that builds on your therapeutic skills. While most clinicians already know to ask whether a client has an intent to die, a suicide plan, or access to a means for carrying it out, it’s important to go beyond simply posing these questions to get a fuller picture of the client’s risk of suicide. Disruptions and demands—such as the loss of a relationship or social and financial status, overwhelming expectations and obligations, legal entanglements, and instances of abuse, bullying, or other traumas. Suffering—from emotional problems (depression, mania, anxiety, anger, obsessive thinking), psychiatric problems (hallucinations and delusions), social pain (conflicted identity, shame), sleep problems, and physical problems (pain and illness). Troubling behaviors—those that increase the danger of a client’s situation, such as withdrawing from activities and other people, engaging in substance abuse or disordered eating, acting impulsively or compulsively, and harming oneself or others. Desperation—which encompasses many of the most urgent indicators for concern, such as hopelessness, an intense desire for relief, an intent to die, a plan for making a suicide attempt, a history of making one or more attempts, or making preparations for a future attempt. To get a deeper sense of whether clients are in imminent danger of making a suicide attempt, you must obtain a clear view not only of the likelihood that they’ll act on their desperation, but also of their resources for making it through the crisis. To this end, you’ll want to explore intra- and interpersonal sources of resilience, protective beliefs, exceptions to problems, past successes, current skills, and effective strategies for dealing with stressors. For example, I once saw a former college football player whose game-hardened ability to keep moving forward, regardless of injuries and pain, served as a source of resilience when he felt like succumbing to suicidal thoughts. Also, some of my deeply religious clients have been protected by their faith’s prohibitions against suicide. I can almost always find some degree of variation in my clients’ desperation. If there are times when they feel more overwhelmed and depressed, that means there are times when they feel less so. Some clinicians routinely use boilerplate no-harm or no-suicide contracts, hoping to secure a troubled client’s commitment to live and lessen their own legal exposure if the client were to end up completing suicide. Research has shown, however, that signing such contracts doesn’t afford the client any added protection; and when sued, clinicians who use contracts don’t fare any better in the courtroom. Instead of no-harm or no-suicide contracts, I prefer working with clients to construct a uniquely relevant safety plan, a resource-based to-do list that identifies protective steps the client and his or her significant others are willing and able to undertake. 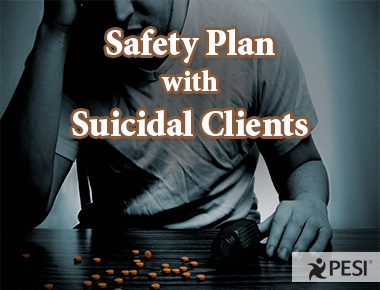 In developing the safety plan together, first decide how the client and significant others can restrict access to all possible means for attempting suicide. You can also explore reasonable alternatives to troubling behaviors for coping with distress and identify safe havens the client could access for a limited time if necessary. Write down the contact information for anyone who could offer a safe haven or other forms of support. A safety plan is designed as a temporary measure to get suicidal clients through distressing times, so you need to make sure the plan is reasonable and doable. A plan that’s too elaborate or demanding isn’t safe. Once the safety plan is complete, make a copy for your file and give the original to the client. Ultimately, suicide assessments are inherently anxiety-provoking and emotionally taxing, even when they go well and the client can safely negotiate harrowing desires, thoughts, and circumstances. Following an assessment, it helps to secure time with colleagues to talk through how the client presented, what you were able to discover, what you decided, how the client responded to the process as a whole, and what you were experiencing throughout the process. Taking care of yourself in this way will help you feel better prepared the next time. This blog is excerpted from "Talking on the Edge" by Douglas Flemons. The full version is available in the September/October 2013 issue, The Selling of Psychotherapy: What Are the Rules in Today's Market?